That day, back when I was still a server, I wanted to run back to my car and pretend to be in a traffic jam, but it would be hard to pull off while being parked in the parking garage. Then comes the next one: All of them want water with lemons. LOTS of lemons- “and be sure to understand LOTS, lady.” It means a whole sack freshly picked from your personal lemon tree so they can make their own lemonade because they don’t want to/can’t spend the money on lemonades. On top of that, they are campers – people who just won’t leave, even after their digestive systems have told them to move on. This camping procedure could take as long as 2 am, when the restaurant closed, so I would have to pitch a tent outside the restaurant while the lemonade-makers are still dining and yodeling with Margaritas. Well, every server’s experiences differ. On the other hand, I have walked into a nice, high-end restaurant with my German parents, all of us speaking in German. We were sat in the way back of the room where they kept their stuffed deer on the wall. The hostess glared at us as if we were angry babies in highchairs, and proceeded to slam the menus on the table. We got ignored for fifteen minutes before my dad asked a server standing around if we could have some drinks at least. The server acted nice and apologized, but I could tell she had wanted to give the table away. I overheard them saying that Europeans don’t tip and that our language sounded “scary”. So even after we had our dinner served to us one hour after ordering, staff staring as they stood around, my father still tipped our server 20% of the bill and silently handed the stunned server the book. My father could have not tipped her at all for that kind of awful behavior, and she would have blamed it on us being German. So both servers and guests should never assume. 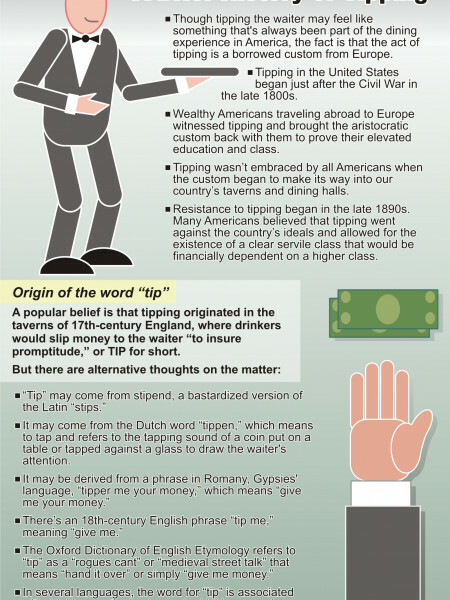 Did you know where tipping comes from? The drinkers that populated the quaint taverns of 17th century drunk England would slip their waiters money before they ordered, in order to get “prompt service”. They got this idea from overnight guests in private homes, who would provide sums of money, which they called vails, to the host’s servants. This custom first ambled its way over to the United States in the Civil War era and became hugely unpopular to Americans, who believed TIPS threatened their way of life. If you didn’t know, 19th-early 20th century America had two classes: aristocrats and bitterly poor. You’ll hear different stories on this. But, since tipping is still a real thing in the United States, let me offer you 5 TIPS (To Insure Proper Service) that many servers and bartenders wished you knew. If you already know this as a guest, disregard (or read on for fun). Thank you for thanking me on my wonderful service and beautiful demeanor. Now give me the money. Your words don’t pay my rent. Unless your server is a complete moron and doesn’t know how to use POS or other systems, which does happen, the server is not responsible for a medium-cooked steak versus the well-done one you ordered. Another factor can be that the food runner took out the wrong food. Mistakes happen – don’t assume. Also, “86” means we’re out of your item, in case you ever hear it said. That is also not your server’s fault, unless they were made aware ahead of time. In “Life is Beautiful”, there is a quote said by one of the characters: “God serves men, but he is not a servant to men”. God forbid you treat your servant badly, either, if you have one. I understand Facebook/Instagram/Snapchat/Kik/Twitter/Pinterest/Vine is your whole life and your only life, but I have a job to do, so if you do not respond to my greeting and question of what you would like to drink, I will choose for you. Same goes for all kinds of disrespect. Your mannerisms do rub off on your server. Also, if you move from table 20 to table 46 please let someone know. Chances are you are not interesting enough for me to remember what you looked like. Finally, if you enter a restaurant 5 minutes till close, be prepared for a tired server and do not go anywhere near the kitchen, because you will encounter lots of angry faces. “Closed” means “kitchen closed”. We understand food will come out wrong or way too late in order for you to let Feefee your chihuahua out for her daily pee-break. However, when a manager buys your food for you, it is a courtesy, not mandatory. Do you scream at people in Publix to buy your cucumbers for you if they look like old pickles? No. You exchange them. I worked in a restaurant where, toward the last year I worked there, the management had changed drastically and was so weak it gave away free food at the slightest hint of a complaint, so guests started coming in demanding free food. I thought I worked at a charity. Follow the rules. Tip: Old-school is 15%. 20%-25% is mainstream. 30% and more is very generous and you might even get some free stuff like extra monkey sticks in your to-go box. On the other hand, 10% and less means you want to pick a fight or become infamous on Twitter. Also, when the bill for your Happy Hour Piña Colada dinner happens to be $2… please tip $2 or more. It seems confusing, but a server can’t do much with a nickel tip, unless they lived in the 1910s. Gratuity: This is “extra” after the tip has been added. Some restaurants add a tip to the check, especially if the tab is for a larger party (8 or more). Check at the bottom of the receipt if you’re uncertain. It will be beneath taxes. Mandatory tips: This is a tip you need to pay, and usually a restaurant will let you know beforehand if they have this. Mandatory tips are usually 15%. In the United States you can possibly get arrested for refusing to tip. This happened one time in an Italian American Grill in New York, where a customer tipped 10% instead of the mandatory 18%. The owners called the police and he was arrested and charged with “theft of service”.